Leather requires a special regimen of care and attention to be properly maintained and preserved. Cleaning your leather regularly, whether or not grime is visible, is important for the long-term protection and vitality of the leather. Even oil from your skin contaminates the surface and causes random particles to adhere to the leather. Over time, leather that is not regularly cleaned and conditioned becomes worn and dull from pore-clogging dirt. 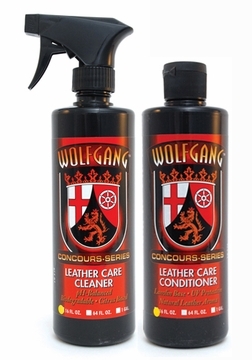 The Wolfgang Leather Care Combo maintains the luxurious look and feel of leather with simple, effective products. Wolfgang Leather Care Cleaner is a gentle, pH balanced, 100% biodegradable cleaner which utilizes the natural cleaning strength of citrus to remove virtually any dirt, grease, ink, oil, or spills from your leather. It penetrates deep into the pores and gently lifting away foreign particles, pollution and contaminants, including microscopic dirt particles that build up over time. This water-based, pure cleaner contains no petroleum distillates, silicone oils or gloss agents, therefore will not dull, stain or cause drying of your leather.